Damon 'Dam-Funk" Riddick is the epitome of funk. 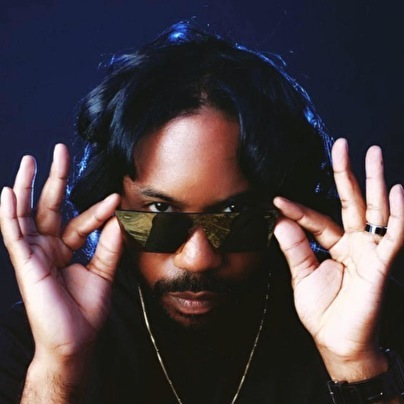 Ever since debuting with Stones Throw in 2008, Dam-Funk has become one of the genres most passionate proselytizers, out to save it from devilish depictions of cartoonish caricature. To Dam, funk is a way of living, 'a feeling of struggle and staying cool through it all." In 2013, he released his celebrated partnership with hip-hop's Snoop Dogg titled 7 Days of Funk. Fresh for '15, Dam returns with a solo project nearly six years in the making: Invite the Light. Dam-Funk grew up in the Los Angeles city/suburb of Pasadena. A '70s baby, he came of age in the era of the Uncle Jamm's Army parties, of electro-pharaoh Egyptian Lover, of Prince's purple reign. His parents nurtured his musical talents as a child and by his teens, he mastered the drums, then the drum machine. A chance encounter led to an apprenticeship under funk songwriter/producer Leon Sylvers III (SOLAR Records) and by the mid-90s G-Funk era in hip-hop, Dam found his musical skills in high demand by rappers such as Mack 10 and MC Eiht. 'Everybody was trying to do the live instrumentation thing, so then you got cats like me playing on records," Dam explains. Sideman status wasn't enough though. Dam remembers 'watching gold plaques hitting the wall" for everyone but him and he decided to go 'full-funk" and make a do-or-die try to become an artist on his own terms. In 2006, Dam-Funk and a few friends launched the popular Funkmosphere party in L.A., bringing the boogie back. It's around then that Dam drew the attention of Stones Throw and both label and artist related to Dam's insistence that 'funk is not just a Jheri Curl. There was more than that." Dam's partnership with Stones Throw has now included everything from his 2009 LP Toeachizown, to an anthology of early productions, Adolescent Funk (2010), to 2013's Higher and 7 Days of Funk. Invite the Light isn't just Dam's first solo full-length since '09, he thinks of it as his first fully-realized effort – a 'concise, beginning-to-end vision – that's resulted in a loosely autobiographical concept album inspired by the trials and tribulations of his personal and professional life of the last six years. As always, Dam flexes his multi-instrumentalist talents by handling all the production but still makes time for guests including rapper Q-Tip, the father-son duo of Leon Sylvers III & IV, and funk giant Junie Morrison of the Ohio Players, who opens and closes the album with dire warnings of what could happen in a world without funk. Rest assured, Dam is here to make sure that never comes to pass. As he puts it, 'funk is the underdog, the black sheep of black music," and if that's true, Dam-Funk is its shepherd.